Al-Ahli (Premier League) inked 33-year old American (has also New Zealander passport) forward Marcel Jones (203-99kg-85, college: Oregon State). Jones played in the summer at SC Rangers in New Zealand NBL league. In 15 games he recorded very impressive stats: 23.2ppg, 10.2rpg, 2.3apg and 1.4spg. A very good season in his career as he was voted to Australiabasket.com All-New Zealand NBL 2nd Team, All-Domestic Players Team and League Player of the Week. Jones ended the last season at Al Gharafa (D1) in Qatari league. But the most of that year he spent at Al-Riffa where in 23 Premier League games he averaged remarkable 30.8ppg, 16.7rpg, 3.4apg, 2.4spg and 1.0bpg. It was a very successful season in his career as he was awarded Asia-Basket.com All-Bahrain League Forward of the Year and voted to 1st Team and voted to All-Imports Team. In 2008 Jones was drafted by Iowa Energy (D-League) in fourth round (50th overall). He attended Oregon State and it will be his eleventh (!!!) season in pro basketball. Among other achievements Jones' team won New Zealand NBL Regular Season in 2010 and 2016. He is a very experienced player. Jones has quite traveled the world as his pro career brought him to twelve different countries on four different continents (Europe, Asia, Australia and of course North America). Jones has played previously professionally also in Bosnia (HKK Zrinjski HT Mostar), Finland, Germany, Hungary, Italy, Kosovo (Prishtina and Bashkimi), Romania (Pitesti), Slovenia (Helios), Syria (Al Wahda), Turkey (Akhisar Bld) and United Kingdom. His game is described as: Strengt: Forward with good size for the 3 position. Aggressive offensively using his length to go inside against smaller players Has a decent midrange game and some polished moves going to the basket Has good length, long wing span Solid rebounder Stays with in his comfort zone, doesn't try to do too much or get out of control Improved defensively showing the ability to pick up a fair number of steals His overall feel for the game is solid. 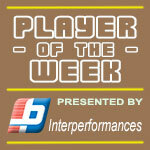 Former international Center Mike Karena (208-C-93) put on an amazing game in the last round for Rams and that's him to receive a Interperformances Player of the Week award for round 2. The 25-year old center had the game-high 36 points adding nine rebounds for Rams in his team's victory, helping them to crush Rangers (#7, 1-2) with 23-point margin 91-68. Rams is placed at 4th position in New Zealand NBL. They would have been even better if they hadn't lost that single game earlier this season. Rams will need more victories to improve their 2-1 record. Karena turned to be Rams' top player in his first season with the team. The second most remarkable performance in last round's games was 26-year old American power forward Jalen Billups (198-F/C-92, agency: Haylett Sports) of Huskies. Billups impressed basketball fans with a double-double of 32 points and 15 rebounds. Bad luck as Huskies lost that game 95-105 to Hawks (2-1). The season is still at the very beginning and this lost game may not be such crucial, of course if they start win the games. Let's wait for the next round. Billups is one of the most experienced players at Huskies and has a reputation of one of team's most reliable players. He belongs to the best scorers in the league with 24.0ppg (#3). He also registered 10.0 boards per game. The third best performed player last round was another Huskies' star - Craig Moller (203-F-94, agency: MKP Management). Moller scored 27 points and grabbed seventeen rebounds (!!!). He was another key player of Huskies, helping his team with a 100-99 win against Jets (#9, 0-2). The chances of Huskies not to end season at such low position in the league, however are less than slim as they have already lost 2 games, recording just one victories. With bigger assistance of his teammates, Moller could try to bring Huskies' a little bit higher in the standings. Moller has individually a great season in New Zealand. After only 3 games, he made it on the list of the league's leaders in rebounds with 13.0rpg (#1 in league). There were only 2 rounds played so far and it's still very beginning of the Regular Season in NBL. Here is the last round review presented by ESL. Saints smashed Huskies in Wellington 87-60. The best player for the winners was Australian power forward Nick Kay (206-92, college: MSU Denver) who scored 20 points and 8 rebounds. International guard Shea Ili (184-92) chipped in 19 points, 6 rebounds and 4 assists. Saints' coach felt very confident that he used 10 players which allowed the starters a little rest for the next games. American guard Tre Nichols (180-89, college: Boise St., agency: SDJ Sports) produced 18 points for the guests. Huskies will play next round against Rangers trying to get back on the winning streak. Saints will try to continue on its current victory against Rams in Christchurch. The most crucial game of the last round was a loss of Giants (1-1) in Stoke. Hosts were defeated by Sharks (2-0) 100-91. Forward Hyrum Harris (198-96, college: Umpqua CC) orchestrated the victory by scoring 18 points and 7 rebounds. Mitchell McCarron contributed with 20 points and 5 rebounds for the winners. Australian forward Rhys Vague (206-96) replied with 23 points and 8 rebounds for Giants. Giants' coach rotated ten players in this game, but that didn't help. Sharks will play against Saints in Wellington in the next round and it will be for sure the game of the week. Giants will play at home against Jets (#9) to get more than just one victory in their record. An interesting game was played in Auckland where Rams (#5) crushed host Rangers (#6) with 23-point difference 91-68 on Saturday evening. Mike Karena scored 36 points (!!!) and 9 rebounds (on 18-of-21 shooting from the field) to lead the charge for the winners. Venkatesha Jois responded with 17 points and 8 rebounds. The winner was already known earlier in the game, so both coaches allowed to play the bench players saving starting five for next games. Rams will meet at home Saints in the next round and it will be for sure the game of the week. Rangers will play against Huskies (#6) in Hobart and it may be a tough game between close rivals. A very interesting game took place in Palmerston North. It ended with only one-point home defeat of Jets (0-2) to Huskies (1-2) 100-99 on Thursday evening. Craig Moller notched a double-double by scoring 27 points and 17 rebounds to lead the effort. Jets' coach tried various players' combinations and tested in total eleven players, but that didn't help to avoid defeat in this game. Huskies' next round opponent will be Rangers (#7) in Auckland. Jets will play on the road against Giants in Stoke and hope to win that game. The game in New Plymouth supposed to be also quite interesting. Rams (2-1) played at the court of Mountain Airs (0-2). Rams smashed Mountain Airs 107-74 on Monday. The best player for the winners was Emmett Naar who scored 15 points and 5 assists (on 6-of-7 shooting from the field). Since the result was very predictable, it gave the chance for the coaches to test many bench players and allowed the starting five to rest. Rams will face Saints in Wellington in the next round and it will be for sure the game of the week. Mountain Airs will play at home against Hawks (#3) and hope to win that game. In the last game of round 2 Huskies were defeated by Hawks in Tamatea 105-95. The most crucial game of the last round was a loss of Giants (1-1) in Stoke. Hosts were defeated by Sharks (2-0) 100-91. Sharks shot 62.9 percent from the field. Sharks had a 28-16 advantage in offensive rebounds. Forward Hyrum Harris (198-96, college: Umpqua CC) orchestrated the victory by scoring 18 points and 7 rebounds. Australian guard Mitchell McCarron (189-92, college: MSU Denver) contributed with 20 points and 5 rebounds for the winners. Australian forward Rhys Vague (206-96) replied with 23 points and 8 rebounds and Australian swingman Daniel Grida (195-98) added 20 points and 7 rebounds in the effort for Giants. Five Sharks and four Giants players scored in double figures. Giants' coach rotated ten players in this game, but that didn't help. Sharks will play against Saints in Wellington in the next round and it will be for sure the game of the week. Giants will play at home against Jets (#9) to get more than just one victory in their record. A very interesting game took place in Palmerston North. It ended with only one-point home defeat of Jets (0-2) to Huskies (1-2) 100-99 on Thursday evening. Forward Craig Moller (203-94, agency: MKP Management) notched a double-double by scoring 27 points and 17 rebounds to lead the effort and American guard Tre Nichols (180-89, college: Boise St., agency: SDJ Sports) supported him with 30 points, 5 rebounds and 5 assists. Even a double-double of 25 points and 10 rebounds by American forward Kuran Iverson (206-95, college: URI) did not help to save the game for Jets. 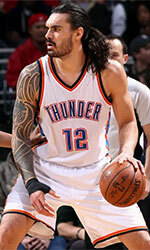 Forward Taane Samuel (200-99) added 23 points and 9 rebounds for the hosts. Four Jets players scored in double figures. Jets' coach tried various players' combinations and tested in total eleven players, but that didn't help to avoid defeat in this game. Huskies' next round opponent will be Rangers (#7) in Auckland. Jets will play on the road against Giants in Stoke and hope to win that game. Saints smashed Huskies in Wellington 87-60. The best player for the winners was Australian power forward Nick Kay (206-92, college: MSU Denver) who scored 20 points and 8 rebounds. International guard Shea Ili (184-92) chipped in 19 points, 6 rebounds and 4 assists. Saints' coach felt very confident that he used 10 players which allowed the starters a little rest for the next games. American guard Tre Nichols (180-89, college: Boise St., agency: SDJ Sports) produced 18 points and his fellow American import power forward Jalen Billups (198-92, college: NKU, agency: Haylett Sports) added 14 points and 7 rebounds respectively for the guests. Huskies will play next round against Rangers trying to get back on the winning streak. Saints will try to continue on its current victory against Rams in Christchurch. An interesting game was played in Auckland where Rams (#5) crushed host Rangers (#6) with 23-point difference 91-68 on Saturday evening. Rams had a 35-24 advantage in offensive rebounds. The former international center Mike Karena (208-93, college: Wright St.) scored 36 points (!!!) and 9 rebounds (on 18-of-21 shooting from the field) to lead the charge for the winners and American forward Isaiah Wilkins (203-95, college: Virginia) chipped in 13 points, 5 rebounds and 6 assists during the contest. Australian forward Venkatesha Jois (203-93, college: EWU) responded with 17 points and 8 rebounds and Nigerian-American center Nnanna Egwu (211-92, college: Illinois) scored 17 points and 6 rebounds. Both teams had four players each who scored in double figures. The winner was already known earlier in the game, so both coaches allowed to play the bench players saving starting five for next games. Rams will meet at home Saints in the next round and it will be for sure the game of the week. Rangers will play against Huskies (#6) in Hobart and it may be a tough game between close rivals. Hawks used a home court advantage and beat the opponent from Hobart 105-95 on Sunday night. Hawks looked well-organized offensively handing out 27 assists. The best player for the winners was international swingman Ethan Rusbatch (196-92, college: Lincoln Trail CC) who scored 33 points (!!!). American forward Shaquille Thomas (201-92, college: Cincinnati) chipped in a double-double by scoring 22 points, 10 rebounds and 4 assists. American power forward Jalen Billups (198-92, college: NKU, agency: Haylett Sports) produced a double-double by scoring 32 points and 15 rebounds and forward Craig Moller (203-94, agency: MKP Management) added 13 points, 14 rebounds and 6 assists respectively for the guests. Both teams had four players each who scored in double figures. Hawks will face Mountain Airs (#8) in New Plymouth in the next round where they are favorite. Huskies will play at home against Rangers and it may be a tough game between close rivals. The game in New Plymouth supposed to be also quite interesting. Rams (2-1) played at the court of Mountain Airs (0-2). Rams smashed Mountain Airs 107-74 on Monday. Rams dominated down low during the game scoring 60 of its points in the paint compared to Mountain Airs' 38. They shot the lights out from three sinking 13 long-distance shots on high 52.0 percentage. The best player for the winners was Australian guard Emmett Naar (185-94, college: St.Mary's, CA) who scored 15 points and 5 assists (on 6-of-7 shooting from the field). 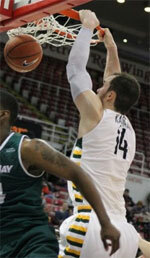 Australian swingman Cameron Gliddon (197-89, college: Concordia Irvine) chipped in 15 points. Four Rams players scored in double figures. Jamaican Kevin Foster (203-89, college: Fresno St., agency: Haylett Sports) produced 18 points and 5 rebounds and international guard Derone Raukawa (181-94) added 16 points respectively for the hosts. Since the result was very predictable, it gave the chance for the coaches to test many bench players and allowed the starting five to rest. Rams will face Saints in Wellington in the next round and it will be for sure the game of the week. Mountain Airs will play at home against Hawks (#3) and hope to win that game.